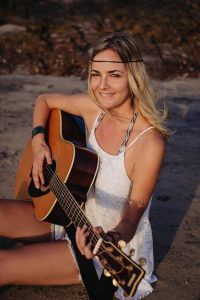 With warm wind in my hair and guitar in my hands, just as the sun was about to disappear behind the Indian Ocean, I started singing the words ‘my inspiration, my inspiration, no expectations.’ I wouldn’t be able to say where it came from – it was one of the songs that seemed to almost write itself. This had not been the first time I climbed up to the mountain top to catch the magnificent view of the changing sky and the glistering sea at sunset, but it was the first that a song came to me right there and then. I felt so humbled and all-so powerful at the same time, knowing I had arrived at a sense of inner peace and freedom, inspired by the fairytale of life and knowingness that my higher consciousness would always be able to create something even better than my present self could dream of. I was struck by life’s beauty and the incredible variety of experiences and encounters – the ones I had already experienced during my inner and outer past journeys as well as the ones that had not yet entered my consciousness. I felt excited about the endless future possibilities, joy for being present, and grateful for the past. My inspiration became a song about how I see and experience the world around me – a testimony to feelings of love, oneness and gratitude of this incredible adventure that we call life. I felt certain that if I stay open to the flow of life and its mysterious ways, seeing new beginnings instead of endings, dreaming without limits and loving unconditionally, anything would truly be possible. It had taken me years of self-development and finding inner peace to arrive to a place of self-love and happiness. This was the kind of feeling I also wanted to share with others – feeling of love and oneness, of peace and freedom. While music had always been a way for me to heal my heart and connect with my higher consciousness, I started feeling the time had come for me to follow a path of spreading the good vibes and happiness to others, raising our collective vibrations and create a new free world. After finally following my dream and starting music as a profession, I couldn’t imagine a better song to record as my first single. “My inspiration” was released on Friday March 29. It has been composed, written and produced by Sharlena. The artistic producer Jimi Hietanen who mixed and mastered the song has also been involved in the arrangement. Click here to listen to her music on Spotify. Click here to listen to her music on iTunes. Click here to watch her music video on YouTube.